The Nomad 400 is designed to assist glaziers to unload, transport and install glass safely. It has a lifting capacity of 400 Kg's (880 Lbs). It can rotate glass measuring up to 4400 mm (180"). It has adjustments to allow for side and top pocket glazing. The Mule 300 is designed to assist glass workers to unload, rotate and transport large plates of glass in shop. It has a lifting capacity of 300 Kg's (660 Lbs). It can rotate glass measuring upto 4400 mm (180"). The Mule has a 12 volt battery powered vacuum pump. The Glassboy 350/500 is a below-the-hook vacuum lifter that is a reliable, efficient and safe method of handling nearly any smooth, nonporous material, including glass, metal, stone, plastics and laminates. 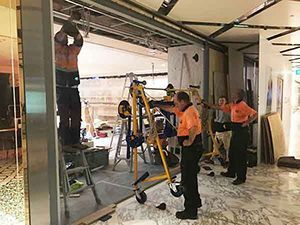 Quattrolifts were commissioned by Regal Glass NSW to manufacture a Nomad to lift 500kg.3 glaziers were required to unload, transport and install 4455mm x 2970mm x 15mm Ultra Clear Toughened Glass plate weighing 496 kg. Glass was installed inside 2 hours. no sweat and safe as! Call us if you need a customised machine.